Your Daily Dose of Sabino Canyon: Fred finds a few flies! Text and fly photos from Fred Health: "Two weeks ago I was up on Mt. Bigelow scouting butterflies a day prior to the Sabino Canyon Summer Butterfly Count, when I came across this black insect with orange wings. It appears, at first glance, to be a Tarantula Hawk (a Pepsis wasp that preys on tarantulas). 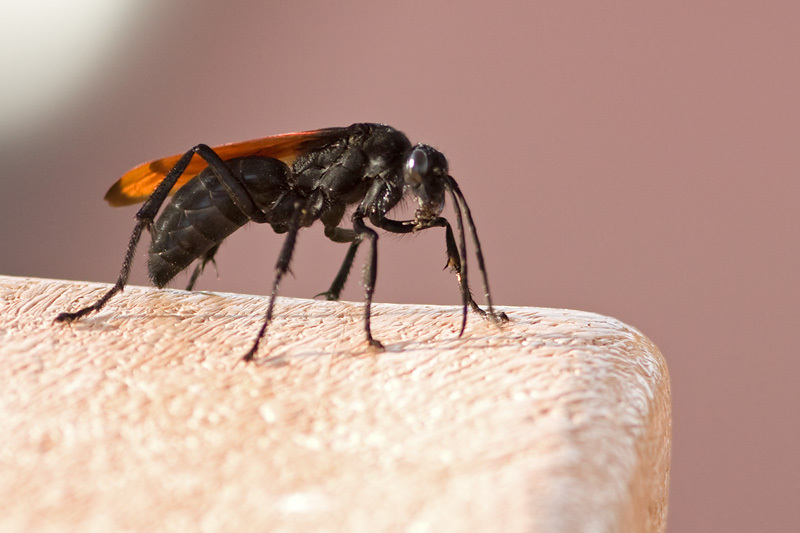 However, its short antennae and large eyes give away that it isn't a wasp, but is, in fact, a fly. Further, its behavior of perching on scrub from which it sallies forth after insect prey, as well as its breaded face tells us it is a robber fly (in the family Asilidae)." Fred continues: "I watched these robber flies take a Tachinid Fly and a Nais Metalmark (butterfly). Many species of robber flies mimic bees and wasps, maybe in part for protection, but certainly to trick prey into not realizing they are robber flies. Tarantula Hawks were seen that day nectaring on various flowers right alongside butterflies, bees, and other flies which paid them no mind." Anne says: Thanks, Fred, for today's post. If you have Sabino Canyon-related 'stuff' to share, please send it to me and I'll do my best to work it into a post.